What Do Obama and David Hasselhoff have in Common? In the theme of "do we really need another social network?" comes a bold move by celebrity David Hasselhoff who has started his own social network called Hoffspace in late August. Since then I've been watching it to see the reaction and have been surprised by both the response and the amount of activity its getting. I won't get into the multitude of social tools, UGC and activity in his social network - because we all know its not about the technology - bottom line is his fans have enthusiastically responded. The user experience is train wreck - but that doesn't seem to matter, from my experience when you have an enthusiastic following people will tolerate a lot of UX issues. Its been publicly reported that over 13,000 users signed up on the first day. Whats so new about a celebrity doing social networking? Many celebrities are prominent on large social networks and many leverage social tools/ social marketing in their promotions. The difference is that I haven't seen celebrities building a dedicated social network around THEMSELVES as a brand! I suppose you could argue that the current politicians running for election are doing just that EG: Obama. It begs the question - is the Hoff just another self-obsessed celebrity or a social networking pioneer? On the business side - will we start to see social networks created around CEO's or tech celebrities? Or are the Robert Scobles of the world already social networks unto themselves? Who would you like to see create their own social network? Is this the end or the explosion of social networks as we know it? So many companies are now using social media to communicate more effectively with their customers - and Starbucks is no exception. I spent some time today on the MyStarbucks Ideas site - which to me looks suspiciously like Dell's Ideastorm concept...but I give Starbucks credit for creating a forum for consumers to share ideas and vote /comment. My idea is simple - Starbucks does a lot of things well - good coffee, interesting locations. One of its challenges though I believe is to create a sense of conversation and community within its locations. I've seen some interesting programs in new media that to me would be a great step forward in terms of promoting this kind of engaging conversation. For instance one of the ones that springs to mind is a new online program called "The Alcove with Mark Molaro" which is based in New York. They have wonderful conversations with fascinating world-class guests and it seems to me that this sort of program is the kind of thing that would foster subsequent conversation and community within Starbucks locations. The key is to provide cultural leadership through media to promote conversation and community within Starbucks locations. That would be a quantum leap in terms of engagement and experience at Starbucks. Thank you. " If more companies opened up the conversation directly to customers to allow them to share ideas the insights would be phenomenal. What will be most interesting to see is what Starbucks does with these ideas - how will they review and implement? What Flavor of Web Strategist Do You Need? I've been working in web for 12 years now - I built my first community strategy for a client in 1996. If its one thing I have learned its that everyone considers themselves to be a "strategist". Having said that, when you are working on web initiatives of any significant size you are working as a part of a team, an eco-system of people who all bring something important to the table. In a conversation with a client we were reviewing just how many different flavors of web strategists there are - and how do clients determine what kind of web strategist they need? General Web Strategist - this kind of web strategist has a broad and deep experience base, has usually come from an agency or consulting background... has really "been there and done that" with almost any kind of web project or business model. They are experienced enough to be flexible to work on most kinds of web projects and the best ones have implemented their strategies. Web Marketing Strategist - a strategist who is focused on outbound web marketing techniques. They live and die by data and results. Brand Strategist - usually focused on more of the creative, UI and brand elements of web. These strategists usually come from a creative or agency background. Advertising Strategist (Media, SEO, SEM, WOM) Focused on media and online advertising. CRM/ Web Strategist - a strategist focused on the customer contact strategy, customer touchpoints and CRM. A sub-set of this can be relationship marketers or database marketers. It will be interesting to see how this role evolves given how social media has changed the touchpoints companies have with customers. Web Analytics Strategist - focused on the measurement and analytics of web. Could encompass everything from basic web analytics to rich media, community and social media analytics. Like web marketers, for this strategist - data is king. User Experience Strategist - a strategist that looks at the audience in detail and optimizes the overall user experience. Often these strategists come from an information architecture or creative background. Content Strategist - plans the overall content in a web site - which could include editorial, third party content or user-generated content. Considerations such as assessing audience content needs, publishing strategy, licensing, syndication of content are all considerations. Technical Web Strategist - sometimes referred to as a "Solutions Architect" Looks at the technology and infrastructure needs, technical requirements and informs the development needs. Typically these strategists come from a consulting or developer background. Subject Matter Experts - Web strategists focused on a specific industry (SMB), point solution (wikis. blogs) or audience segment (Gen Y). Community Strategist - A strategist that understands the complex interactions between community members and the ongoing needs, opportunities and dynamics of online communites. A sub-set of this could also be Community Managers who are very hand-on yet closely tied to the strategy of how to build, grow and manage the community. Social Media Strategist - focused on leveraging social media for marketing purposes. In my opinion the best social media strategists are those that walk their talk - they actually blog, they use Twitter, they belong to social networks and communities. I don't agree with Steve Rubel that the need for these roles will eventually disappear - I think that’s a wishful-thinking PR perspective. I have seen increasing demand in our enterprise client base for web and social media skills. While I do agree that these skills will eventually become required for all marketers, I believe that there is always room for experienced, quality consultants. Jeremiah Owyang did a post on the need for the social media manager and two distinct roles that Forrester sees emerging: the social media manager and the community manager. Most enterprise marketers are just beginning to experiment with social media and I believe its a long way off before they acquire deep skills. In the meantime, when leveraging the skills of a web strategist, its important to ensure that you are engaging the right kind of strategist to meet your objectives. Today I spent the morning attending an amazing event in San Francisco: The Chocolate Salon at Fort Mason and it got me thinking about how dramatically the promotion of local events has changed in the past few years with the prevalence of social media and Web 2.0 technologies. 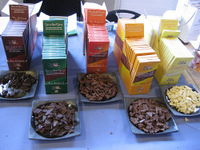 Its a topic that appeals to both the chocoholic and web strategist in me. 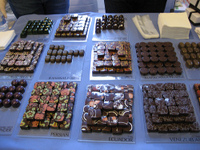 The event itself was fantastic - a chocolatey, gooey and somewhat indulgent day for people who love everything chocolate. I checked out the Chocolate Salon site and hit cacao nirvana when I discovered TasteTV's "Chocolate TV" video segments!!! On it you can see every imaginable story around chocolate and the event: some examples of chocolate couture, chocolate hairstyles, stories about some of the fantastic chocolate manufacturers and retailers that we have right here in San Francisco. How does social media play into it? For starters, like a lot of things I go to these days I learned about the event from both upcoming.org and meetup.com from my friends listing it as something that they were going to. - Comments on the event sites, blogs, etc. and then there is the use of so many "sharing" tools that are inherent in many of the above that create a viral effect: "send to a friend", tagging, send a message, get link, get code. What else could have been done? Social bookmarking on sites like Delicio.us or Ma.gnolia, recipe sharing, links to food or chocolate blogs, a wiki on chocolate related topics, mobile alerts, FaceBook groups ...the list goes on and on. What social tools do you use for events?